Good friends of LBFN over the years, Jonathan Evens and Rosy Fairhurst, have been working to establish Sophia Hubs. The first Hub is going live next month in north east London – sign up at sophiahubs@yahoo.com. 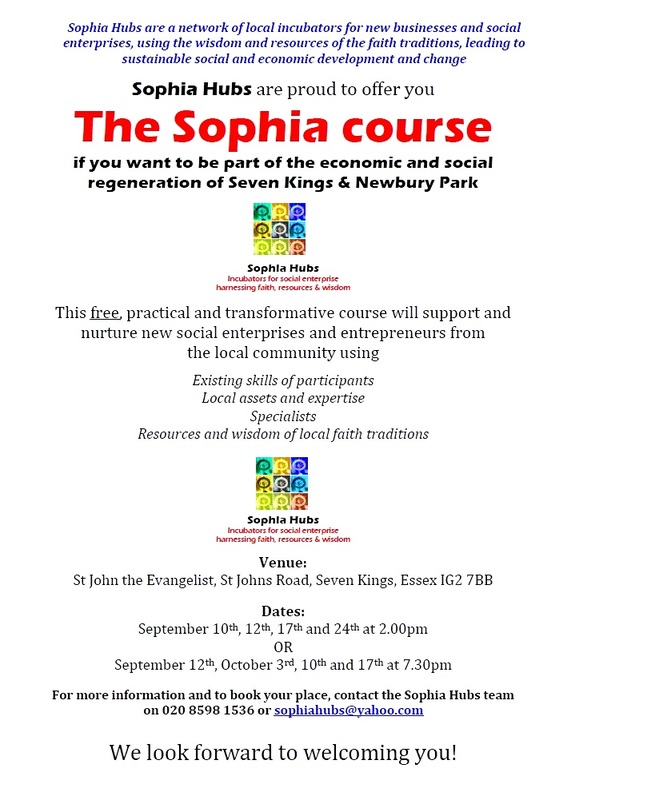 “Sophia Hubs are proud to offer you the Sophia Course, if you want to be part of the economic and social regeneration of Seven Kings & Newbury Park. This free, practical and transformative course will support and nurture new social enterprises and entrepreneurs from the local community using: Existing skills of participants; Local assets and expertise; Specialists; and Resources and wisdom of local faith traditions. For more information and to book your place, contact the Sophia Hubs team on 020 8598 1536 or sophiahubs@yahoo.com. We look forward to welcoming you! This entry was posted in Barking & Dagenham, Social Labs and tagged ecomomic development, Sophia Hubs, sustainable development, wisdom by Catriona Robertson. Bookmark the permalink.